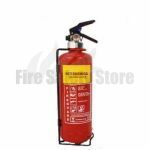 Here at Fire Safety Store, we appreciate that although the largest fire extinguishers are pretty handy to have around in large premises, they are not always the most practical solution in smaller situations. 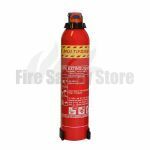 We have a range of small fire extinguishers, a popular choice amongst small office areas, workshops and domestic buildings as well as cars, caravans, vans, boats and caravans. 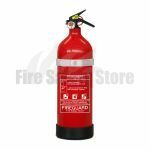 Small fire extinguishers are very useful for the home and office environments due to the fact that you are able to place them out of the way so nobody accidentally walks into them, yet they are still very useful and competent. Our range of small fire extinguishers consists of ABC dry powder extinguishers of 1kg and 2kg as well as a 2 litre AFFF foam option. 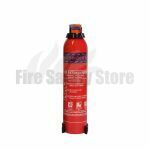 ABC dry powder small fire extinguishers are suitable for use on Class A fires involving solid materials, Class B fires involving flammable liquids and Class C fires involving flammable gases making them adaptable to many different premises and scenarios. Dry powder extinguishers are the only recommended extinguisher when it comes to Class C fires and can be used as a last resort against electrical fires. They are not as effective as carbon dioxide at fighting electrical fires and leave a residue that will render equipment permanently damaged. Small fire extinguishers that contain ABC dry powder are subject to BS EN3 regulation. As well as the traditional red body associated with fire extinguishers, these canisters have an easily identifiable blue label to make recognising them easy when searching for the right type of extinguisher for a burning fire. Our 2 litre AFFF extinguisher is suitable for use on Class A (solid materials) and Class B (flammable liquids) offering a level of versatility for vehicle, business and home owners and tenants. Premises which are more at risk of both Class A and Class B fires can take advantage of adaptable AFFF foam small fire extinguishers as they cover a lot of potential fire risks and weigh much less similar sized water filled canisters. BS EN3 regulations state that foam fire extinguishers should carry a cream label for easy identification should they need to be called upon. Our extinguishers conform to these guidelines to provide as effective and efficient fire safety as possible. 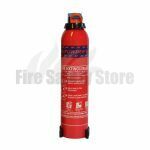 Just like the rest of our canisters, all small fire extinguishers supplied by Fire Safety Store are Kitemarked and CE marked as appropriate. We offer a five year guarantee across the range and provide complementary fixing brackets for easy storage and access when needed. We are proud of our secure payment processes and superb delivery system. Order by 2pm and you will receive your products the very next day. If you’re unsure about anything, or would like to enquire about something you can’t find here onsite, feel free to call us on: 0800 316 0890 and a helpful member of staff will assist you.